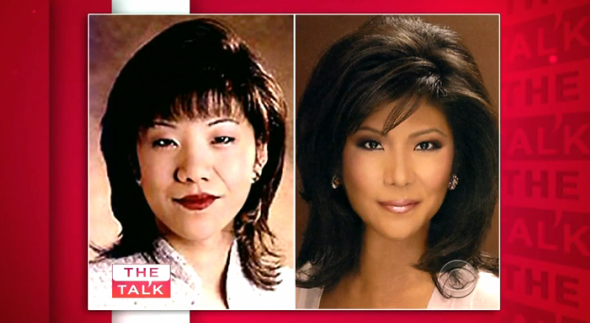 On Wednesday, TV personality Julie Chen revealed she underwent plastic surgery nearly 20 years ago after being told she could never make it in journalism because of her "Asian eyes." "I asked my news director over the holidays, 'If anchors want to take vacations, could I fill in?' And he said, 'You will never be on this anchor desk, because you're Chinese,'" Chen said about her time at a local Ohio station. "He said, 'Let's face it, Julie, how relatable are you to our community? How big of an Asian community do we have in Dayton? On top of that, because of your heritage, because of your Asian eyes, sometimes I've noticed that when you're on camera, when you're interviewing someone, you look disinterested and bored because your eyes are so heavy, they are so small.'" Chen attempted to find another job shortly after that with the help of a new agent--but the agent she approached agreed with her news director. "He said, 'I cannot represent you unless you get plastic surgery to make your eyes look bigger.'" The issue divided Chen's family, she said, but she went forward with the surgery. "After I had done it, the ball did roll for me," she admitted. After her surgery and after leaving Ohio, Chen landed CBS anchor gigs and an eventual job hosting Big Brother, and also ended up marrying the head of the network. I will admit that when I first saw the headline Thursday morning, I didn't think much of it (other than to shake my fist at the racist news director and agent who advised Chen.). Yes, it was terrible, but was it that surprising this was a thing that actually happened? Of course not. The concept of this kind of surgery is not new, particularly to those in the Asian community. I remember playing with makeup when I was younger with my non-Asian friends, and wondering why I couldn't use eyeshadow the way our Seventeen and Teen People magazines suggested. I felt frustrated backstage in makeup rooms before musicals and shows because the women applying makeup would have lengthy conversations in front of me about what to do about my eyes (not to mention that alopecia had taken my eyebrows early on as well). But I was surprised at the reactions I browsed through on Twitter and in the comments sections on various articles. There was a genuine shock that a Chinese woman would have surgery to make herself look less Chinese. Some people were angry that she gave in to the pressure and changed who she was in order to further her career, but I don't think that's necessarily fair: Chen's choice was a personal decision she made about her own body. Women (and men) of all color make decisions about their own bodies every day that are theirs to make. Perhaps if Chen's decision was a result of the growing pressure on personalities to look a certain way, then we can have a different conversation about the standards of beauty set in Hollywood and the media. But Chen's decision was a result of racism, a statement she took for truth, and it resulted in her conscious choice to try to distance herself from a visible marker of her heritage. And it worked: she was rewarded for it. And that's unfortunate, because it doesn't celebrate the diversity that makes up America; it punishes those who look different. "Did I give in to 'the man'?" Chen wondered aloud to her co-hosts. I think the frank answer to that is: yes, at the time you did. But she felt it was necessary to be successful in her chosen profession, and she turned out to be right about that. At the time in the mid-90s, there were very few Asian journalists on network TV. (Hell, in 2013, there are still few.) Chen may have "given in" to the pressure to change her appearance in order to gain any sort of recognition from her peers that she could be a major player in the media, but I absolutely disagree with any suggestion that she was wrong to do it. And she's speaking out about it now, which is so necessary because it's opening up a conversation that I don't think many Americans knew was being had. When Chen started talking about how she would watch back the tapes of her interviews and focus on her eyes, I began to instantly relate: I did that with photographs often, and would notice snapshots where I would look bored or disinterested, though it had nothing to do with my mood. My smiles looked fake because my eyes weren't expressive, and I used to obsess over it. In fact, I still do obsess. My mother's oldest sister used to use the "Scotch tape" method to create that double eyelid illusion, and while I never did it (okay--I tried it once, and nearly blinded myself), I met more than a dozen people in an Asian American Psychology class in college who admitted they've used it before too. It was a painful solidarity to feel, but it validated the anger I knew I rightly felt when, as an 18 year old, a stranger balked at the idea I could ever be a journalist--because I "don't look like the people you see on NBC or something." One girl who sat next to me in the psych class admitted she'd gone the Scotch tape route, but "only for big events, like prom and class photos." "Wasn't it uncomfortable?" I asked her. She just shrugged, as if to repeat that old adage: beauty is pain.